Wishon Golf pioneered the use of a smaller, 0.335″ tip construction to create hybrid shafts which offer as much as +4° higher launch angle over conventional 0.370″ hybrid shafts. S2S Black is a heavier weight (95-100g) hybrid shaft for players who prefer the weight of steel in their conventional irons. S2S Black hybrid design is created for golfers with an average to stronger Transition, average to faster Tempo, and a later to very late Release. 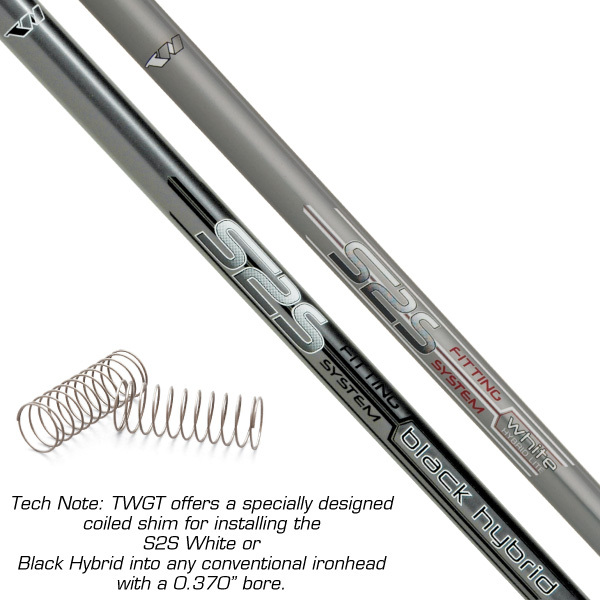 S2S Black hybrid shafts are available in R and S flexes for all hybrid heads with a 0.335″ bore. TWGT pioneered the use of a smaller, 0.335″ tip construction to create hybrid shafts which offer as much as +4° higher launch angle over conventional 0.370″ hybrid shafts. S2S White is a lighter weight (70-75 g) hybrid shaft for players who have been playing graphite shafts in their irons or who prefer a lighter total weight feel. S2S White hybrid design is created for golfers with an average to smoother than average Transition, average to smoother Tempo, and an early to midway Release. S2S White hybrid shafts are available in AA(L), A, R and S flexes for all hybrid heads with a 0.335″ bore. I was hoping to get your feedback on using the Black Hybrid shaft. I am planning on putting it into a 775HS #2 head. I am going as short as possible, to be the next step from my Sterlings, but with my (very) jumbo grips that’ll have me around 39.5-39.75″ to get around a preferable ‘D’ swingweight. With my added weight (27-29g, depending on epoxy), would I be okay with tip trimming a stiff flex 1.5″? My driver swingspeed is around 110-112, if that helps. I might get an extra shaft and test it in a setup for either my 950HC 5W (@ 41″) or 18deg 590DIH (@ 40.25″) heads…? I’d like to compare feel/results with my swing. Do you think this would be a bad shaft to use with the 950HC/590DIH? I do really like the extra weight of this shaft for these heads. You did not say how much your preferred very jumbo grips weigh but if they are up there in the range of 70-80g or more, you probably won’t be able to get a D range swingweight with the 775-2 at 39.5-39.75″. By my calculations, using the 100g weight of the Black hybrid shaft with a normal 232g head weight for the 775-2 at 39.5-39.75″ and estimating for both a 70 and 80 gram grip, with a 9 gram weight in the weight bore and a 9 gram weight in the sole weight bore, with the 70g grip you may get close to a D0 but with an 80g grip you will be in the mid to upper C range of swingweight. When you use super heavy grips, you have to throw swingweight measurements out the window because the heavy weight of the grip forces the actual swingweight measurement so low due to the effect it has on the scale. In reality the swingweight measurement with very heavy grips becomes misleading. However, if you have been using very heavy grips for a long time AND you have also been able to achieve a D range swingweight in other such clubs, then you will probably need to pursue that since you would be used to how the head weight feels with such a heavy grip. But if using the super heavy grip is somewhat new to you, then I would say to start playing the club at a mid C range just to see if you can feel the presence of the head enough during the swing. Then add weight from there a little at a time until you get to a point that you feel the weight in the head enough to allow for decent swing timing and tempo. The other direction on this is of course to go with a little longer length because that will add to the sense of feeling the head more. For a 2 hybrid being at 40″ to even 40.5 is not really out of the question by any means. Shaft wise, the Black hybrid is definitely a shaft for people with a later to very late release who also prefer a little heavier total weight in their clubs. It is a hybrid shaft and not a wood shaft so I feel if you use it in a fwy wood, it would feel a little on the stiff side. But as you go longer with a wood to say 41-42 and with no tip trim, it would soften up and not be so stiff. We’ve never done experiements with any of our hybrid shaft as wood shafts so I am sorry I don’t have much guideline there for you to follow. You’ll be on your own experimentation wise. THANK YOU for your reply TOM. When I had submitted my question through the form on this page, it didn’t act like other pages I’ve used on your site… so I didn’t know my question made it to you. I’m glad that it reached you! My grips, usually including some build-up wraps, are typically in the 95-100g range. The calculations I use must be off. I entered in 232g (head), 18g (2x weight bores), 9g (tip weight) and added 1g for epoxy/ferrule. With the S2S Black Hybrid shaft (100g) and a total length of 39.5″ I was getting just over a D swingweight… but now I’m second guessing all that. You’re right about my issue with the heavy grips. I have been using over 90g grip setups for almost 2 decades now and have become accustomed to them. I believe I can use a 40″ #2 hybrid without any problems. I have a 40.25″ 18 degree 590DIH and love the feel of it. I had it reamed to .370, added a hosel weight, and installed a heavy graphite shaft (119g) in order to get it over a D.
It’s just my LOVE for your Sterling irons is wanting me to get everything as short as possible. I’m hoping for a 39.5″ 775HS #2 hybrid (since my irons are at 37.5″). I plan on assembling a 42″ 950HC 3W and possibly a 41″ 16.5 degree in between…? I have a later release and do typically prefer a heavier feel from the clubhead, so I think the shaft would be good for me. I appreciate your added feedback there with that, especially about the tip trimming when it comes to longer woods. I may just use it for the #2 hybrid but was wondering if it could work for me with the 41″ 16.5 degree install as well. Thanks again TOM. As always, your support is top notch and valued greatly! This is the comments section of the site. It’s not the same as a forum. So when comments are posted they have to be approved before they show up and before you would be notified. It’s just that way as part of the site software I guess so people can’t just post trash or spam about something. On that club you made that is 40.25″ with your 95g grip and 119g shaft, if you added a 9g hosel weight to the 232g head weight, you would be at around C9 swingweight. If the shaft happened to be tip heavy in its design, then you could get to the very low D range in swingweight but not over D1. So with the Black hybrid shaft at 100g, your 95g grip, 40″ length, you would have to put a 9g weight into BOTH the hosel and sole weight bores of the 775-2 head to get the club up to D0. At 39.5″ you would have to add some lead tape to the head in addition to the 9g weight in both weight bores to get up to the low D range. Sorry I can’t tell you anything definitive about the use of the Black Hybrid shaft in a fwy wood. All I can say is that you would need to shaft up a 4w to see if it performs ok for you. I greatly appreciate your feedback and support. 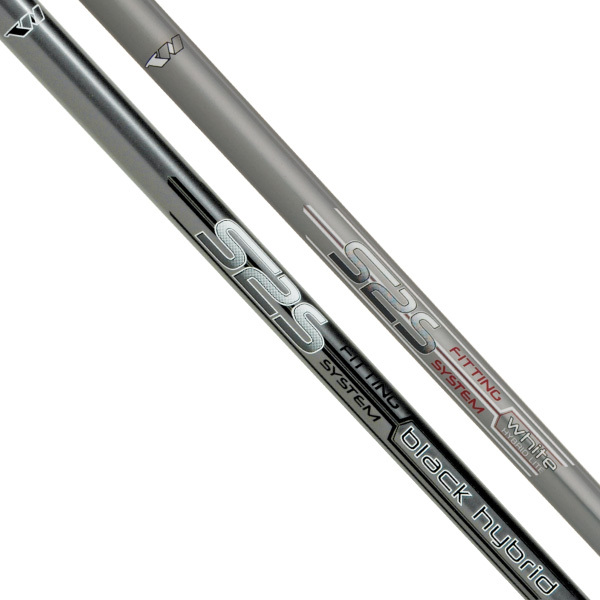 I may just use the S2S Black Hybrid shaft for the 775HS #2, for now anyway. I am SO looking forward to putting your 775HS hybrid design to use. I have been wanting a #2 for some time now, to come between the Sterling Irons and my fairway woods. I appreciate your suggestions as I believe as long as I end up with (close to) a D swingweight that I can make it work for me. It maybe slightly lighter than I am use to but that shouldn’t be a problem. But when you’re playing clubs like these, your amazing designs, I don’t see how you can lose in any way. Thanks TOM… I hope you and your family have a very Happy Thanksgiving! There are two ways clubmakers install the coiled shim to be able to install a 0.335 shaft into a 0.370 bore. Some like to install the shim in the hosel first, then install the shaft into the hosel with the shim in place with a slow rotating motion on the shaft as it is inserted. Others like to put the shim on the shaft first, then install the shaft with the shim in the hosel also with a rotating motion. Takes a little practice either way. Absolutely no effect whatsoever on performance or ball flight because all you are doing it taking up the space in the hosel between the 0.370 bore and the 0.335 shaft – and the weight of the shim is so light it has no effect on swingweight or headweight feel in the club.